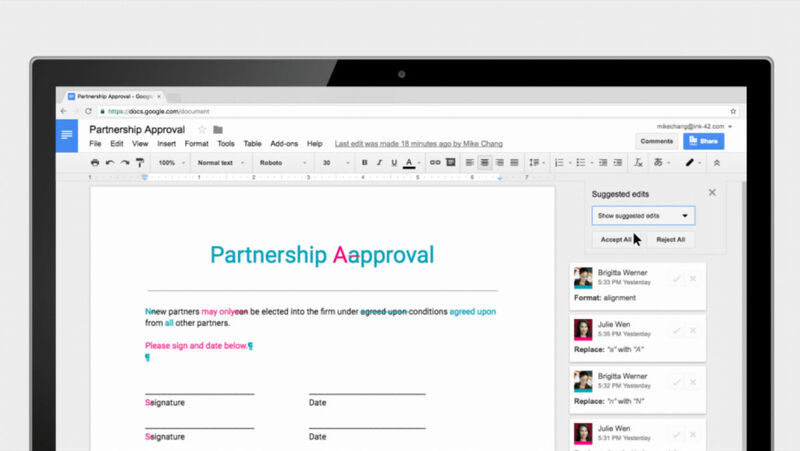 Google is rolling out many improvements for collaborative users of Google Docs, Sheets, and Slides. Moving forward, users should find it much easier to finish up documents and forms that require multiple people. Specifically for Docs, individual users inside of a collaboration can name versions of a document, preview “clean versions” of documents, and also accept or reject all edit suggestions at the same time in a document. On top of that, Google is also introducing new templates with built-in add-ons, plus the ability to create your own. For example, one of the templates is a standard NDA form that can collect signatures using the DocuSign add-on for Google Docs. As you can see, these changes are geared towards G Suite users who work with others, so if this describes you, have at it.